Protect your crops for 1/10 the cost of building a full size greenhouse, using Low Tunnels. Carol Coleman demonstrates how to build both stationary fixed in-place and Our NEWEST innovation the movable, Modular Low Tunnel. Carol is building 4'X10' Low Tunnels using our Model MH-4 Low Tunnel Hoop Bender but the same building steps can also be used with 3' & 6' wide hoops. Carol shows how to build a Low Tunnel by simply pushing the hoops into the ground and using quick plastic cross snap clamps to install the straight center purlin to hold the hoops at correct spacing on top. She then uses snap clamps to secure the covering. 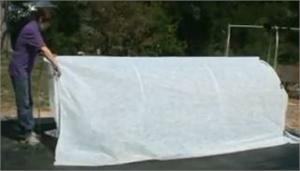 Later in this video, Carol will show you how simple it is to build a portable Low Tunnel. RC-4 Hoop Benders Frame Bending Tools were designed exclusively for the Homeowner Do it Yourself gardener. The RC-6 Series Low Tunnel (row cover) Hoop Bender bends a perfect, 6 foot wide, row cover hoop, using 1/2", 3/4", 1" EMT tubing (electrical metal tubing or conduit) or 1 3/8" fence top rail tubing.